More writing courses than ever are being taught online, and effective online writing instruction requires teachers to communicate deliberately and clearly in order to have productive relationships with their students. 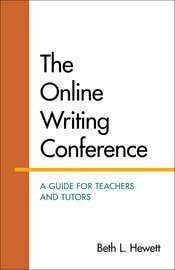 In The Online Writing Conference: A Guide for Teachers and Tutors, former chair of the CCCC Committee for Effective Practices in Online Writing Instruction Beth L. Hewett articulates the how and why of one-to-one online writing conference pedagogy. Complete with an instructor’s study guide and informed by the principles set forth in the CCCC Position Statement of Principles and Example Effective Practices for OWI, her updated text provides examples and transcripts of synchronous and asynchronous instructor-student interaction, targeted lessons, and conferencing action plans that help instructors hone their pedagogical practice, from formatting comments to showing regard for students.